The trees have ears and the rice can sing. There are two sisters but only one place set at the table. There’s barely enough food for one, and they both insist that the other goes first. The first mouthful leads to the second, and within moments, what little was there is gone. Two malnourished adults, one momentarily sated, the other starving in the service of the Best Nation in the World. 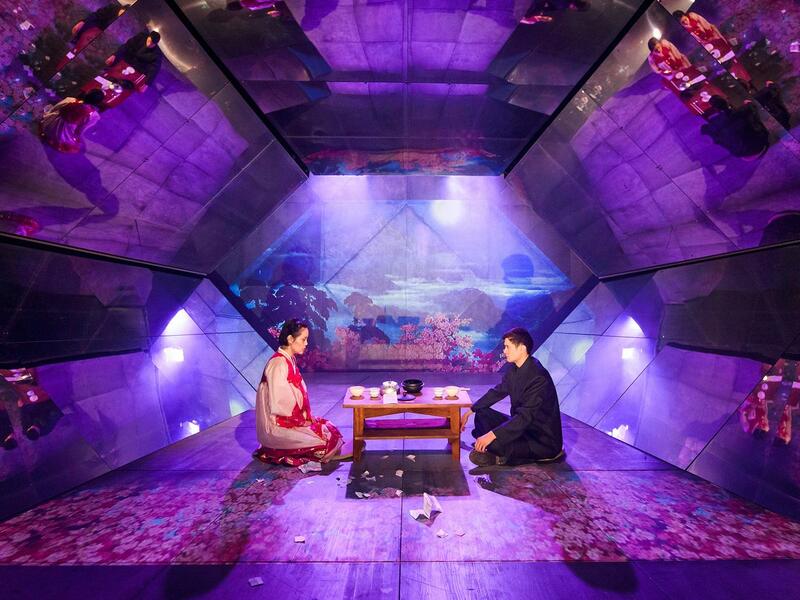 Mia Chung’s You for Me for You is a surreal play about exchange and sacrifice, played out across a phantasmagorical North Korea and a New York made strange. One sister successfully crosses the border, and one doesn’t make it. The crossing demands a sacrifice. The man who helps the sisters to the border tells Junhee (Katie Leung), the younger sister, that one day according to her North Korean watch ‘will give you a few years in America’, and the play gives her a those years – experiencing the US as an outsider, slowly familiarizing herself with the language in bizarre conversations with Liz (Daisy Haggard), working in a hospital, eventually falling in love with a southerner called Wade – so she can cross back into the country as an American to save her sister Minhee (Wendy Kweh), who has fallen down a well during the crossing. It doesn’t make literal sense, but it makes moving dramatic sense. Junhee learns about a democracy’s freedoms and its own unspoken limits (Wade extols the virtues of the States: “You can speak freely here”, but is nervous to be near her when she refers to the “Yankee devil”) and Minhee, travels in her mind to reach her son, sent away for reeducation, and her husband, missing, presumed dead. Jon Bausor’s kaleidoscopic set reflects and refracts video work from Tal Rosner, reinforcing Chung’s textual fantasia, a world where trees might have ears, and rice can sing. Examining the playtext reveals that the cuts and rearrangements of Richard Twyman’s production further obfuscate the story, but balances the surreal elements and the promise of resolution expertly. Feeling narratively aimless only once or twice in its ninety minutes, You for Me for You’s combination of two quests, two sisters, two countries and two border-crossings make for an ambitious debut play and an engrossing, tragic, political and personal fairytale.